Prague Medical Report is an English multidisciplinary biomedical journal published quarterly by the First Faculty of Medicine of the Charles University. 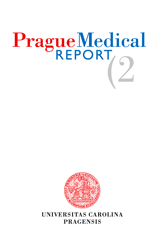 Prague Medical Report (Prague Med Rep) is indexed and abstracted by Index-medicus, MEDLINE, PubMed, and Scopus. Primary scientific studies on the medical topics (not exceeding 30 pages in standardized A4 format – i.e. 30 lines and 60–65 characters per line – including tables, graphs or illustrations). The use of abbreviations should be restricted to SI symbols and those recommended by the IUPAC-IUB. Abbreviations should be defined in brackets on first appearance in the text. Standard units of measurements and chemical symbols of elements may be used without definition. All the sources of relevant information for the study should be cited in the text (citations such as „personal communication“ or „confidential data“ are not accepted). It is not permitted to cite any abstract in the References list. References should be listed alphabetically at the end of the paper and typed double-spaced on separate pages. First and last page numbers must be given. Journal names should be abbreviated according to the Chemical Abstract Service Source Index. All co-authors should be listed in each reference (et al. cannot be used). Teich, N. (1984) Taxonomy of retroviruses. In: RNA Tumor Viruses , eds. Weiss, R., Teich, N., Varmus, H., Coffin, J., pp. 25-207, Cold Spring Harbor Laboratory, Cold Spring Harbor, New York. References in the text should be cited as follows: two authors, Smith and Brown (1984) or (Smith and Brown, 1984); three or more authors, Smith et al. (1984) or (Smith et al., 1984). Reference to papers by the same author(s) in the same year should be distinguished in the text and in the reference list by lower-case letters, e.g. 1980a, or 1980a, b.
Manuscripts (in UK English only) must be delivered in the electronic form via Online Manuscript Submission and Tracking system ( http://www.praguemedicalreport.org). In case of problems, contact the Prague Medical Report Office ( medical.report(at)lf1.cuni.cz). The online submission has to include the complete version of the article in PDF format, separately the manuscript as a MS Word file and a cover letter. The detailed version of the Instructions to Authors can be found at: http://www.praguemedicalreport.org/download/instructions_to_authors.pdf. Text should be written in MS WORD only. We accept only documents that have been spell-checked with UK English as a default language. Please, write your text in Times New Roman script, size 12, and line spacing 1.5. Text should be justified to the left, with no paragraph indent (use Enter key only); do not centre any headings or subheadings. Document must be paginated-numbered beginning with the title page. Tables and graphs should represent extra files, and must be paginated too. Edit tables in the following way: Make a plain text, indent by Tab (arrow key) all the data belonging to a line and finish the line by Enter key. For all the notes in table, use letter x, not *. Make your graphs only in black-and-white. Deliver them in electronic form in TIFF or JPG format only. Deliver illustrations and pictures (in black-and-white) in TIFF or JPG format only. The coloured print is possible and paid after agreement with the Prague Medical Report Office. The corresponding (or first author) of the manuscript must print, fill and sign by his/her own hand the Authors Declaration and fax it (or send by post) to the Prague Medical Report Office. Manuscript without this Declaration cannot be published. Each manuscript is evaluated by the editorial board and by a standard referee (double blind peer review process with at least two peer reviewers). After the assessment the author is informed about the result. In the case the referee requires major revision of the manuscript, it will be sent back to the author to make the changes. The final version of the manuscript undergoes language revision and together with other manuscripts, it is processed for printing. Concurrently, proofs are electronically sent (in PDF format) to the corresponding (mailing) author. Author is to make the proofs in PDF paper copy and deliver it back to the editorial office by fax or as a scanned file by e-mail. Everything should be done in the required time. Only corrections of serious errors, grammatical mistakes and misprints can be accepted. More extensive changes of the manuscript, inscriptions or overwriting cannot be accepted and will be disregarded. Proofs that are not delivered back in time cannot be accepted. The journal applies the Creative Commons Attribution 4.0 International License to articles and other works we publish. If you submit your paper for publication by Prague Medical Report, you agree to have the CC BY license applied to your work. The journal allows the author(s) to hold the copyright without restrictions.